The phase started off with an eighteen day period of ground school during which we completed the Airbus A320 technical module, which proved to be the most intensive period of theory training since our ATPL ground school. All of the CBT and the aircraft manuals were provided for us on iPads, which certainly cut down on the paperwork because, as I’m sure you can imagine, the A320 is full of complex systems and equipment which we had to know very well for the exams. To do this, in addition to the CBT we had two hours each day to put the theory into practice in CTCs Virtual Flight Decks (VFD), which are fully interactive simulators of the flight deck. The topics covered in the exam ranged from the basic, such as windows/doors, interior furnishing and lighting to the more complex topics of navigation, automation and flight controls. As well as the iPad program, the main source of information was the easyJet/Airbus FCOM (Flight Crew Operating Manual) which, at just over 4000 pages long, certainly contains all that we are required to know about the aircraft! It took just over two weeks to get through the material, and after a couple of revision days it was time to sit the exam which consisted of two parts, A and B. Part A was made up of the vast amount of technical knowledge, QRH procedures and the various aircraft limitations which we had been learning, whilst part B focused on performance and EU OPS. After completing the second exam we had a classroom session looking at the Panasonic Toughpad, a tablet which EasyJet use to calculate the aircraft performance and display the LIDO airfield charts. It was great to put some of the theory into action on the device we will be using at the airline, and it also prepared us for the start of the intermediate and advanced phases where the ‘Toughbook’ (an older varient of the toughpad) is used to calculate the performance for each simulator detail. Prior to each detail, we are given a completed loadsheet (exactly the same as those used for real), which details the number of passengers and cargo on board and where it is located. We then enter this into the toughbook in order to get various aircraft information including zero fuel weight, % centre of gravity, takeoff weight and takeoff speeds. This information is then checked and entered into the aircrafts FMGC (flight management guidance computer) where it is used by the aircraft to make a huge number of calculations. In addition to the ground school, we received some excellent news as we finally found out our bases. I’m very happy and excited to be heading to Gatwick in the new year to begin my career at EasyJet! Ground school made for an intense few weeks, and after a couple of days off the first of our thirteen intermediate simulator sessions began. Despite the intermediate phase being much shorter than basic, the lessons are much more advanced and focus greatly on the handling of complex failures and more advanced procedures in a multi-crew environment. One of the biggest differences is that all of the simulator details from the start of the Intermediate phase are with full motion turned on, which is great fun! The first few lessons focused on getting our landing and takeoff techniques ‘perfected’, including crosswind techniques and different approach types such as circling, precision and non-precision (all of which we had seen previously in the basic phase). We also had another upset recovery session which again enabled us fly the aircraft to it’s absolute limits and get comfortable flying it when things may not be going to plan! As I mentioned in a previous article, the inclusion of upset recovery training followed the crash of Air France 447 in 2009, and it has formed a vital part of our training throughout New Zealand, Bournemouth and back here in the simulators at Nursling. Also introduced in this phase was the use of more complex features of the FMGS (flight management and guidance system), the use of LIDO airport charts, and more advanced operating conditions such as windshear, cold weather, storms and low visibility operations. A number of new situations, such as TCAS RA’s ( Traffic Avoidance System, Resolution Advisory – the act of avoiding another aircraft on a collision course with yours!!!) and even what to do if you suspect a bomb on board were introduced, which not only involved a good amount of hand flying but a huge step up in our management and decision making skills. Each phase on the MPL culminates with a competency assurance flight, and the intermediate phase was no different. This time around, the competency flight involved a TCAS RA on departure, an electrical fault in the climb and, just as we thought things couldn’t get any worse, a ‘bomb on board’ threat, giving us a matter of minutes decide where we were going to divert to and how we were going to manage the situation. It was a challenging and, despite the seriousness of the topic, fun flight which really required us to prioritize and manage the situation for a successful outcome. 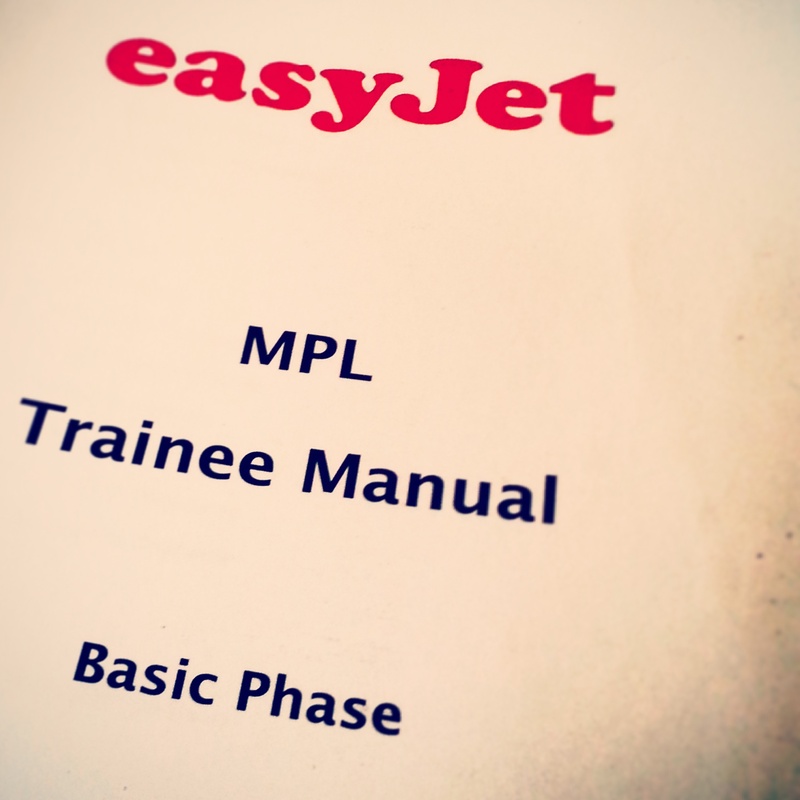 Due to our staggered start dates at EasyJet, from here on in EZMP01 are split into two groups for the advanced phase. I am in the first half and started earlier this week, and with three simulator sessions done it is becoming apparent just how close the end of the course is! My LST (license skills test) is just four weeks away and the lesson content has definitely stepped up once again compared with the intermediate phase. Again, the majority of the lessons involve a various number of failures and emergency situations which have already included a full electrical failure at V1 (a ‘GO’ situation, meaning you must take the problem into the air) and other varying electrical failures. We have twelve simulator details to complete before Christmas after which we return in groups of two for our final four simulator details. Two of these are the final preparation lessons for our LST (license skills test), which takes place over the following two simulator details and includes a lot of single engine flying, as well as precision and non precision approaches, raw data flying, ECAM procedures (Electronic Centralized Aircraft Monitoring, a feature which displays vital actions and system information in emergency situations) and much more. It is after this two day flight test that, thinking positively, we will finally be qualified pilots and the course at CTC will come to an end after an incredible eighteen months. Following this, we have a couple of weeks before starting our training at easyJet which involves a couple of weeks of ground training, two days of flights on the jumpseat and the all important base and line training. It’s all suddenly becoming very real, and we are all extremely excited. Away from training itself there has also been a lot going on. Recently a number of us took a trip to Gatwick to check out the local area and look at places where we could live next year. It was a busy day, but in true cadet fashion we took a bit of time to head to the runway threshold to get a look at our new toys coming in to land. With the sun setting, it made for a breathtaking view. Yesterday was also CTCs last 2014 open day, so myself and a coursemate decided to help out for the day. It was great to speak to so many aspiring pilots and their families, and I hope that those who came managed to get a good feel for the facilities and have any questions answered. I really enjoy helping out at these events, and it’s something I hope to continue doing in the future. For those who missed it, CTC will be running open days once monthly starting in January, so there are plenty of chances to head down and check out the training centre. You can find out the latest dates over at the website (details will be added soon). As usual, if anyone has any questions, feel free to contact me using the ‘contact me’ menu option. With this vital training phase approaching, there won’t be many updates on the website over the next few weeks so have a great Christmas, and I will speak to you all again in January! Our aviation themed tree. Merry Christmas!